Managers at the Royal Cornwall Hospital are defending a new £400,000 robot that dispenses medicines. 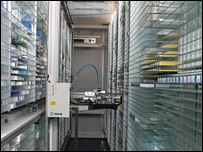 The machine automatically issues drugs and maintains stock levels, freeing pharmacy staff to work more closely with patients. The new robot, one of the first of its kind in a South West hospital, will more than pay for itself in savings, say hospital bosses. They said it would also reduce the need for separate emergency stores. Senior pharmacist Alison Hill said: "It just makes us all the more efficient. "It is also saving a great deal in waste, by making sure we use medicines up before they are expired which is much harder to do manually."